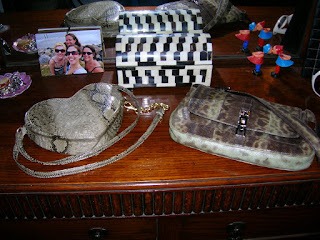 Snakeskin seems to be slithering back in fashion. Or did it ever even go anywhere? Regardless, it’s made a comeback in Mom’s closet with two of her new favorite things (three counting the wallet inside). She bought the small heart-shaped purse with chain strap at an H&M in NYC for just $15. It makes a great going-out, concert bag with its long strap that you can cross over your chest and forget it’s there (until you reach for lipstick . . . or hand sanitizer . . . or cell, wallet, keys . . . in other words, it holds a lot). The real deal Gucci baguette – made of genuine Python, with an exact-matching wallet – has more of a story to it. You’ve heard of the rent-a-purse website Bag, Borrow or Steal (http://www.bagborroworsteal.com), well, in this case, Mom just borrowed . . . from a friend, who lately has been like the big sister (or new cousin!) she never had. Its exquisite design and feel is inducing drool from all of us. It doesn’t get any better than a Gooch. It’s due back to its rightful owner on Mom’s birthday, which considering is months away in September, is already an early present. Who needs snakes in the head when you have them by your side?